Transport-forwarding services include issuing of fulfilling of documents – Bill of Lading, Notice-Receipt, Out-Turn Report, Report Letter, as well as placing of lead stamp, clamps, etc. Warehouse services include preservation of different type cargoes in open and closed warehouse areas of the Port with ensured security according to safety requirements. Additional services proposed by the Port are hiring up of lifting-transporting machines and equipments, handling equipment and inventory owned by the Port. 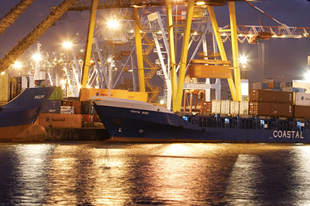 Accompanying services connected with handling of the cargoes, concern lashing and securing, weighting, sorting, packing of cargoes, placing of iron strip, plugging of wagons, opening and closing of ship’s cargo holds, brushing, washing, covering, etc. - Acceptance of garbage and vessel’s residues oil. - Ensuring and supply of vessel with electric power, fresh water, installing of telephone connection, etc. - Ensuring of parking for vehicles in the region of the Port. Conditions of custom keeping for the parts of these cargoes. Individual terms to the every client, possibility to expand terms of the contract to them.